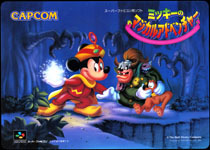 Mickey no Magical Adventure is a side-scrolling platform game by Capcom featuring Mickey Mouse. The game starts on a sunny day when Mickey and his friends peacefully play a game of catch. Sadly, Pluto goes missing and Mickey sets out on a quest with the help of his friends and a wizard to find the poor dog. Our hero has to travel deep into Emperor Pete's kingdom to defeat his minions and take the final fight to his castle. Mickey starts his journey with a really basic power - he can pick blocks and spin-throw them around in the air. He can also jump on his enemies heads to stun them. But soon, our hero mouse learns new special powers and is able to cast incredible magic spells and breath under water with the help of the magician outfit, spray water with the firefighter uniform and his hose or grappling up high platforms with his Climber Outfit and his hoo (the Magician or Fireman outfits are the only ones that need to be recharged during the game though).Mickey can collect gold coins and buy items at local stores scattered throughout the game - they usually sell hearts, magic or water refills and special items. The game includes a (sadly not simultaneous) two-player mode. 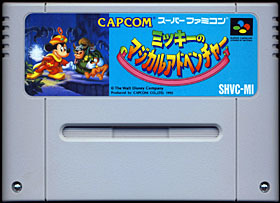 Mickey no Magical Adventure (aka The Magical Quest in the west) is the first opus of a three episode series released by Capcom and Disney for the Super Famicom and other console systems of the time. The first one, Mickey no Magical Adventure (version tested here) was released in 1992 for the Super Famicom and was re-released in 2002 for the Game Boy Advance as Mickey to Minnie no Magical Quest (this portable version get the players to also play Minnie). 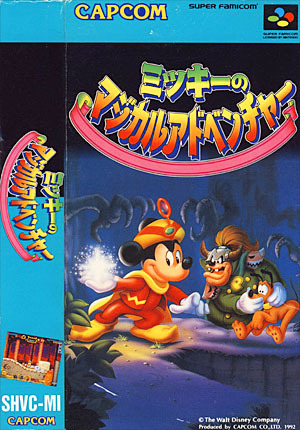 A sequel called Mickey to Minnie Magical Adventure 2 (aka The Great Circus Mystery Starring Mickey and Minnie in the west) came out in 1994 for the Super Famicom system and Sega's Megadrive system. It was also re-released in 2003 for the Game Boy Advance. Mickey to Donald: Magical Adventure 3 was then released in 1995 for the Super Famicom system but sadly never made it to the west - it was however re-released for the Game Boy Advance in 2003 in Japan and in the rest of the world. Pluto has disappeared and his pal Mickey is now on his trail! But evil Emperor Pete won't make it easy. He's snatched poor Pluto and hidden him deep within his dungeon. Now, Mickey must summon his courage and begin a treacherous trek through Emperor Pete's magical world to rescue his chum before it's too late! Jump and touch the clouds as you and Mickey leap past buzzing bees and sinister snakes in the treetops. Journey through the Dark Forest and dazzle Pete's guards with the power of Mickey's magical turban! Sink into the blazing inferno of the Fire Grotto and help firefighter Mickey and head straight for Emperor Pete's castle. Sneak inside, and Mickey must face the awesome might of Emperor Pete's sinister magic! Hurry! Pluto needs your help! Japanese game companies often demonstrate that big licenses do not always mean bad games. Mickey no Magical Adventure is the perfect example of a beautifully crafted game where every single detail is elegant and well taken care of. Graphics are astounding and reminds the likes of Dai Makaimura (aka Ghouls And Ghosts) or Demon's Blazon with wonderful detailed backgrounds and sprites. Music themes are, I think, especially well suited to the 'Story Book' and epic feel of the game and perfectly translate all the various mood changes throughout Mickey's quest. Finally, and not the least, the gameplay is perfect and Mickey's ability to change outfits adds a tremendous depth to the game. Mickey no Magical Adventure is a magnificent title.